”Om Vajra Sattva Hum” or ”Om Benza Satto Hung” (Tibetans pronounce Vajra sattva as Benza satva) is the short version of the 100 syllable mantra for purification. Vajrasattva is the quintessence of all Bodhisattvas. His name can be translated into literal English as “Embodying Reality/Being.” He manifests the purity of mind, speech, and body of all Buddhas. His healing power is incredibly indestructible and powerful. He sits above the mandala of the Five Dhyani Buddhas, which includes Ratnasambhava, Akshobya, Amitabha, Amoghasiddhi, and Vairocana. 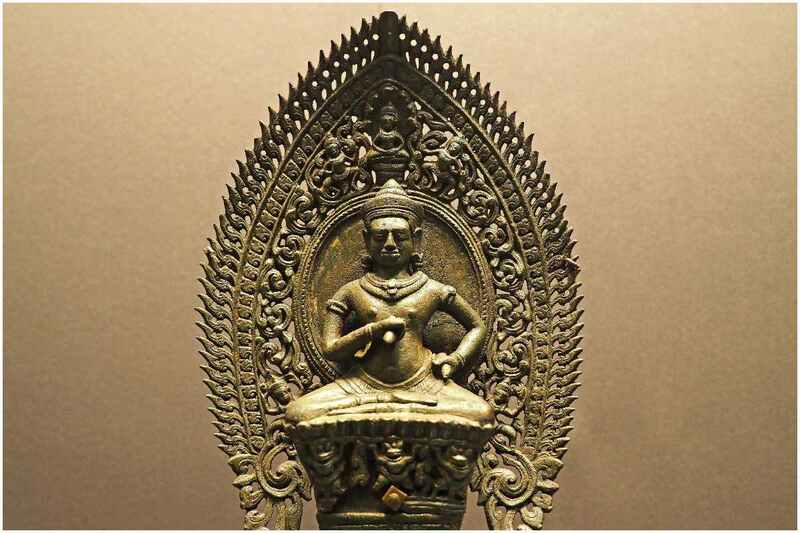 Traditionally, each Dhyani Buddha is associated with certain symbols and attributes. In the Shingon Buddhist lineage, He is usually viewed as the 2nd patriarch, the first being – Vairocana Buddha himself. In the Nyingma tradition, Bodhisattva Vajrasattva is not only a deity of purification but an important meditational deity with many terma and oral traditions. Vajrasattva purification sadhana is an extremely powerful practice for purification. These practices are common to all of the 4 schools of Tibetan Buddhism and are used both to purify obscurations so that the Vajrayana practitioner can progress beyond Ngondro practices (preparatory or foundational practices) to the various advanced yoga practices of tantra, and to purify any broken vows after initiation. The practice of purification is applied by using the Four Opponent powers of the Bodhisattva Vajrasattva: The Power of Regret (this comes from a true feeling of remorse for all negative actions done in the past), The Power of Reliance (you can take Vajrasattva as your support or any spiritual friend or teacher), The Power of Antidote (offset the negativities through accomplishing as many positive actions as you can) and the Power of Promise (remembering the faults, resolve never to commit them again). He is commonly depicted white in color, representing His purity. He is dressed in the Bodhisattva robes of a prince, adorned with jewels, and with long flowing hair. Furthermore, He is commonly seen as the mind’s pure essence and is always holding a vajra (which represents the willful way of action) and a ghanta (representing transcendent wisdom). He is seated on a moon disc on a white lotus with His torso gracefully curved to our left in the dancer’s pose. His legs are crossed in the vajra position. The Vajrasattva mantra can be chanted (aloud or mentally) prior to undertaking a new pathway on the journey of spiritual enlightenment, and as a means of karma purification. If all we know are the teachings of the dharma and we do not practice, then there is no benefit. So we must practice every day. This mantra is usually repeated 100,000 times with the goal of purifying the karma of the practitioner. Completing this practice is seen as essential prior to receiving initiations or ordination in some Tibetan Buddhism lineages.